The main event at Augusta National teed off today, but earlier this week, Digital Check hosted some of our international partners for the second day of practice rounds. Another beautiful day on the course, even with the “clouds” of pollen coming off the pine trees. But that was a small price to pay for great weather and the azaleas in nearly full bloom. The weather (and help from the Augusta National grounds crew) have done the job to make the course picture-perfect for the weekend CBS television coverage, it seems. 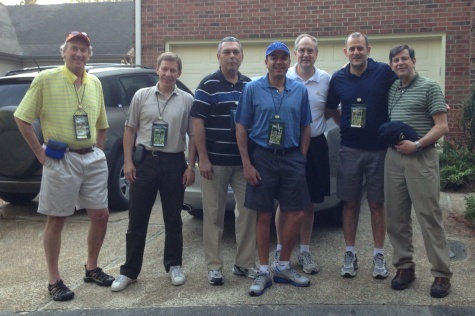 DIGITAL CHECK’S INTERNATIONAL TEAM gets ready for the day’s festivities at Augusta National. Our guests included: Francisco Ayala, Vice President and General Manager of CMP in Mexico, Wladimiro Navarro, Vice President of Worldwide Sales for IPSA Spain, Ghassan Gebraiel, President of Globalis from Canada, representing Digital Check in the Middle East. After the requisite shopping at the store near hole #5 … our plan for the tour of the course (holes #5-4-3-2-1 to clubhouse and practice range) was interrupted as several world-famous players came by – including a group led by Sergio Garcia – and few minutes later, a group of young South Africans led by Gary Player. Many people feel that the practice rounds are “better” than tournament days (a fun debate) because the players are willing to interact with the crowd, cameras are allowed, and you can see the players practicing putts to all four pin placements for the upcoming tournament days. And of course, the crowds around Phil Mickelson, Tiger, Rory, Bubba, Fred Couples, and others are not as large. The tour proceeded with memorable stories from past Masters events, must-see locations like #16 to see the players skip the ball across the water, miss the turtles on shore, and on rare occasions skip up onto the green. Those draw the loudest cheers of the day during practice rounds. But the international team’s favorite site visit, key photo-op, and now a new “must-see” location was Bubbaland – site of “The Shot” by Bubba Watson last year on #10. Those who were watching last year remember Bubba’s incredible curve shot, bending the ball around trees to the green, that won him the 2012 Masters and a Green Jacket. So this new attraction was drawing crowds of 50-100 people all day, including the television crews back up in the pine straw, probably 20 yards off the course.